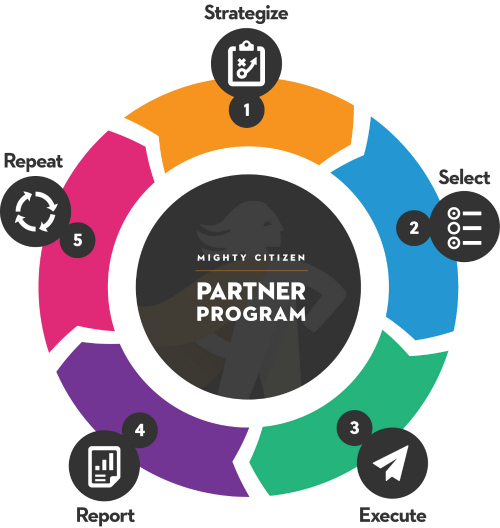 The Mighty Citizen Partner Program is a nimble way to stay ahead of your competition and relevant to your audience. Every month, your dedicated Mighty Citizen team—comprising designers, writers, developers, and digital marketing experts—will help you identify tactics to improve your branding, digital, and marketing efforts. Then we’ll bring those ideas to life. Each month, your dedicated team of designers, architects, and marketing specialists will recommend specific ways to improve your brand—both online and off. You decide which projects to pursue and which to hold for future months. Your goals are turned into reality by your team at Mighty Citizen. You regularly receive detailed updates on what’s been accomplished. Once one project is complete, we move on to the next—constantly improving your brand and attacking new goals.